"Gustavus Adolphus" redirects here. For the college in Minnesota, see Gustavus Adolphus College. For other Swedish royalty by this name, see Gustav Adolf of Sweden. Gustavus Adolphus (9/19 December 1594 – 6/16 November 1632, O.S./N.S. ), also known in English as Gustav II Adolf or Gustav II Adolph, was the King of Sweden from 1611 to 1632 who is credited for the founding of Sweden as a great power (Swedish: Stormaktstiden). He led Sweden to military supremacy during the Thirty Years' War, helping to determine the political as well as the religious balance of power in Europe. He was formally and posthumously given the name Gustavus Adolphus the Great (Swedish: Gustav Adolf den store, Latin: Gustavus Adolphus Magnus) by the Riksdag of the Estates in 1634. He is often regarded as one of the greatest military commanders of all time, with innovative use of combined arms. His most notable military victory was the Battle of Breitenfeld (1631). With a superb military machine, good weapons, excellent training, and effective field artillery, backed by an efficient government that could provide necessary funds, Gustavus Adolphus was poised to make himself a major European leader. He was killed a year later, however, at the Battle of Lützen (1632). He was assisted in his efforts by Count Axel Oxenstierna, the Lord High Chancellor of Sweden, who also acted as regent after his death. In an era characterized by almost endless warfare, Gustavus Adolphus inherited three simultaneous and ongoing wars of his father at the age of sixteen. Two of these were border wars with Russia and Denmark, and a more personal war (at least for his father) with Gustavus' first cousin, King Sigismund III Vasa of Poland. Of these three wars that were passed onto his rule, the Danish war was the most acute one. During his reign, Sweden rose from the status of a Baltic Sea basin regional power to one of the great powers of Europe and a model of early modern era government. Gustavus Adolphus is famously known as the "father of modern warfare", or the first great modern general. Under his tutelage, Sweden and the Protestant cause developed a number of excellent commanders, such as Lennart Torstensson, who would go on to defeat Sweden's enemies and expand the boundaries and the power of the empire long after Gustavus Adolphus's death in battle. Spoils meant he became a successful bookraider in Europe, targeting Jesuit collections. Called "The Golden King" and "The Lion of the North", he made Sweden one of the great powers of Europe, in part by reforming the administrative structure. For example, he began parish registration of the population, so that the central government could more efficiently tax and conscript the people. Historian Christer Jorgensen argues that his achievement in the field of economic reform, trade, modernization, and the creation of the modern bureaucratic autocracy was as great as his exploits on the battlefields. His domestic reforms, which transformed a backward, almost medieval economy and society, were in fact not only the foundations for his victories in Germany, but also absolutely crucial for the creation and survival of the Swedish Empire. He is widely commemorated by Protestants in Europe as the main defender of their cause during the Thirty Years' War, with multiple churches, foundations and other undertakings named after him, including the Gustav-Adolf-Werk. He became a symbol of Swedish pride and even had a song composed for him, "Lion From The North." Gustavus Adolphus was born in Stockholm as the oldest son of Duke Charles of the Vasa dynasty and his second wife, Christina of Holstein-Gottorp. At the time, the King of Sweden was Gustavus Adolphus' cousin Sigismund. The staunch Protestant Duke Charles forced the Catholic Sigismund to let go of the throne of Sweden in 1599, a part of the preliminary religious strife before the Thirty Years' War, and reigned as regent before taking the throne as Charles IX of Sweden in 1604. Crown Prince Gustav Adolph had Gagnef-Floda in Dalecarlia as a duchy from 1610. Upon his father's death in October 1611, a sixteen-year-old Gustavus inherited the throne, being declared of age and able to reign himself at seventeen as of 16 December. He also inherited an ongoing succession of occasionally belligerent dynastic disputes with his Polish cousin. Sigismund III wanted to regain the throne of Sweden and tried to force Gustavus Adolphus to renounce the title. In a round of this dynastic dispute, Gustavus invaded Livonia when he was 31, beginning the Polish–Swedish War (1626–29). He intervened on behalf of the Lutherans in Germany, who opened the gates to their cities to him. His reign became famous from his actions a few years later when in June 1630 he landed in Germany, marking the Swedish Intervention in the Thirty Years' War. Gustavus intervened on the anti-Imperial side, which at the time was losing to the Holy Roman Empire and its Catholic allies; the Swedish forces would quickly reverse that situation. Gustavus was married to Maria Eleonora of Brandenburg,[a] the daughter of John Sigismund, Elector of Brandenburg, and chose the Prussian city of Elbing as the base for his operations in Germany. He died in the Battle of Lützen in 1632. His early death was a great loss to the Lutheran side. This resulted in large parts of Germany and other countries, which had been conquered for Lutheranism, to be reconquered for Catholicism (via the Counter-Reformation). His involvement in the Thirty Years' War gave rise to the saying that he was the incarnation of "the Lion of the North", or as he is called in German "Der Löwe aus Mitternacht" (Literally: "The Lion of Midnight"). Historian Ronald S. Love finds that in 1560–1660 there were "a few innovators, notably Maurice of Nassau and Gustavus Adolphus of Sweden, whom many scholars credit with revolutionary developments in warfare and with having laid the foundations of military practice for the next two centuries." Scholars all agree that Gustavus Adolphus was an extremely able military commander. His innovative tactical integration of infantry, cavalry, logistics and particularly his use of artillery, earned him the title of the "Father of Modern Warfare". Future commanders who studied and admired Gustavus Adolphus include Napoleon I of France and Carl von Clausewitz. His advancements in military science made Sweden the dominant Baltic power for the next one hundred years (see Swedish Empire). He is also the only Swedish monarch to be styled "the Great". This decision was made by the Swedish Estates of the Realm, when they convened in 1633. Thus, by their decision he is officially called Gustavus Adolphus the Great (Gustavus Adolphus Magnus). The Lion of the North: Gustavus Adolphus depicted at the turning point of the Battle of Breitenfeld (1631) against the forces of Count Tilly. Gustavus Adolphus was the main figure responsible for the success of Swedish arms during the Thirty Years' War and led his nation to great prestige. As a general, Gustavus Adolphus is famous for employing mobile artillery on the battlefield, as well as very aggressive tactics, where attack was stressed over defense, and mobility and cavalry initiative were emphasized. Among other innovations, he installed an early form of combined arms in his formations, where the cavalry could attack from the safety of an infantry line reinforced by cannon, and retire again within to regroup after their foray. Inspired by the reform of Maurice of Nassau he adopted much shallower infantry formations than were common in the pike and shot armies of the era, with formations typically fighting in 5 or 6 ranks, occasionally supported at some distance by another such formation—the gaps being the provinces of the artillery and cavalry as noted above. His artillery were themselves different—in addition to the usual complements of heavy cannon he introduced light mobile guns for the first time into the Renaissance battlefield. These were grouped in batteries supporting his more linearly deployed formations, replacing the cumbersome and unmaneuverable traditional deep squares (such as the Spanish Tercios that were up to 50 ranks deep) used in other pike and shot armies of the day. In consequence, his forces could redeploy and reconfigure very rapidly, confounding his enemies. He created the modern Swedish Navy, which successfully transported troops and supplies to the Continental battlefront. Carl von Clausewitz and Napoleon Bonaparte considered him one of the greatest generals of all time, an evaluation agreed with by George S. Patton and others. He was also renowned for his constancy of purpose and the equality of his troops—no one part of his armies was considered better or received preferred treatment, as was common in other armies where the cavalry were the elite, followed by the artillery, and both disdained the lowly infantry. In Gustavus' army the units were extensively cross trained. Both cavalry and infantry could service the artillery, as his heavy cavalry did when turning captured artillery on the opposing Catholic Tercios at First Breitenfeld. Pikemen could shoot—if not as accurately as those designated musketeers—so a valuable firearm could be kept in the firing line. His infantrymen and gunners were taught to ride, if needed. Napoleon thought highly of the achievement, and copied the tactics. However, recent historians have challenged his reputation. B. H. Liddell Hart says it is an exaggeration to credit him with a uniquely disciplined conscript army, or call his the first military state to fight a protracted war on the continent. He argues that he improved existing techniques and used them brilliantly. Richard Brzezinski says his legendary status was based on inaccurate myths created by later historians. Many of his innovations were developed by his senior staff. Gustavus Adolphus's politics in the conquered territory of Estonia also show progressive tendencies. In 1631 he forced the nobility to grant the peasants greater autonomy. He also encouraged education, opening a school in Tallinn in 1631, today known as Gustav Adolf Grammar School (Estonian: Gustav Adolfi Gümnaasium). On 30 June 1632, Gustavus Adolphus signed the Foundation Decree of Academia Dorpatensis in Estonia, today known as the University of Tartu. With policies that supported the common people, the period of Swedish rule over Estonia initiated by Gustavus Adolphus and continued by his successors is popularly known by Estonians as the "good old Swedish times" (Estonian: vana hea Rootsi aeg). I had carefully learned to understand, about that experience which I could have upon things of rule, how fortune is failing or great, subject to such rule in common, so that otherwise I would have had scant reason to desire such a rule, had I not found myself obliged to it through God’s bidding and nature. Now it was of my acquaintance, that inasmuch as God had let me be born a prince, such as I then am born, then my good and my destruction were knotted into one with the common good; for every reason then, it was now my promise that I should take great pains about their well-being and good governance and management, and thereabout bear close concern. 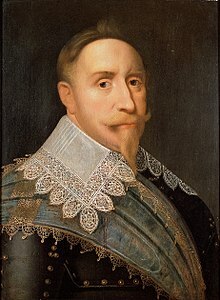 Gustavus Adolphus inherited three wars from his father when he ascended the throne: against Denmark, which had attacked Sweden earlier in 1611; against Russia, due to Sweden having tried to take advantage of the Russian Time of Troubles; and against Poland, due to King Charles's having deposed King Sigismund III, his nephew, as King of Sweden. The war against Denmark (Kalmar War) was concluded in 1613 with a peace that did not cost Sweden any territory, but it was forced to pay a heavy indemnity to Denmark (Treaty of Knäred). During this war, Gustavus Adolphus let his soldiers plunder towns and villages, and as he met little resistance from Danish forces in Scania, they pillaged and devastated twenty-four Scanian parishes. His memory in Scania has been negative because of that fear. In the winter of 1612, during a period of two weeks, did he burn down, or otherwise destroyed 24 Scanian parishes and most of their population without meeting any enemy troops. The largest destroyed settlement was the Town Væ, which two years later was replaced by Danish King Christian IV as the nearby Christiansted (after the Swedification process, spelled Kristianstad), the last Scanian town to be founded by a Danish king. The war against Russia (Ingrian War) ended in 1617 with the Treaty of Stolbovo, which excluded Russia from the Baltic Sea. The final inherited war, the war against Poland, ended in 1629 with the Truce of Altmark, which transferred the large province Livonia to Sweden and freed the Swedish forces for the subsequent intervention in the Thirty Years' War in Germany, where Swedish forces had already established a bridgehead in 1628. The weak electorate of Brandenburg was especially torn apart by a quarrel between the Protestant and Catholic parties. The Brandenburg minister and diplomat baron Samuel von Winterfeld influenced Gustavus Adolphus to support and protect the Protestant side in Germany. When Gustavus Adolphus began his push into northern Germany in June–July 1630, he had just 4,000 troops. He was soon able to consolidate the Protestant position in the north, however, using reinforcements from Sweden and money supplied by France at the Treaty of Bärwalde. After Swedish plundering in Brandenburg (1631) endangered the system of retrieving war contributions from occupied territories, "marauding and plundering" by Swedish soldiers was prohibited. Meanwhile, a Catholic army under Johann Tserclaes, Count of Tilly was laying waste to Saxony. Gustavus Adolphus met Tilly's army and crushed it at the First Battle of Breitenfeld in September 1631. He then marched clear across Germany, establishing his winter quarters near the Rhine, making plans for the invasion of the rest of the Holy Roman Empire. In March 1632, Gustavus Adolphus invaded Bavaria, a staunch ally of the Emperor. He forced the withdrawal of his Catholic opponents at the Battle of Rain, marking the high point of the campaign. In the summer of that year, he sought a political solution that would preserve the existing structure of states in Germany, while guaranteeing the security of its Protestants. But achieving these objectives depended on his continued success on the battlefield. Gustavus Adolphus's lit de parade, by F. and J. Strachen, Wolgast 1633. Towards 1:00 pm, in the thick mix of gun smoke and fog covering the field, the king was separated from his fellow riders and suffered multiple shots. A bullet crushed his left arm below the elbow. Almost simultaneously his horse suffered a shot to the neck that made it hard to control. In the mix of fog and smoke from the burning town of Lützen the king rode astray behind enemy lines. There he sustained yet another shot in the back, was stabbed and fell from his horse. Lying on the ground, he received a final, fatal shot to the temple. His fate remained unknown for some time. However, when the gunnery paused and the smoke cleared, his horse was spotted between the two lines, Gustavus himself not on it and nowhere to be seen. His disappearance stopped the initiative of the hitherto successful Swedish right wing, while a search was conducted. His partly stripped body was found an hour or two later, and was secretly evacuated from the field in a Swedish artillery wagon. After his death, Gustavus's wife initially kept his body, and later his heart, in the castle of Nyköping for over a year. His remains (including his heart) now rest in Riddarholm Church in Stockholm. In February 1633, following the death of the king, the Swedish Riksdag of the Estates decided that his name would be styled Gustavus Adolphus the Great (or Gustaf Adolf den Store in Swedish, Latinized as Gustavus Adolphus Magnus). No such honor has been bestowed on any other Swedish monarch before or since. The crown of Sweden was inherited in the Vasa family, and from Charles IX’s time excluded those Vasa princes who had been traitors or descended from deposed monarchs. Gustavus Adolphus’ younger brother had died ten years before, and therefore there was only the King’s daughter left as a female heir. Maria Eleonora and the king’s ministers took over the government on behalf of Gustavus Adolphus’ underage daughter Christina upon her father’s death. He left one other known child, his illegitimate son Gustav, Count of Vasaborg. Gustavus Adolphus is commemorated today with city squares in major Swedish cities like Stockholm, Gothenburg and Helsingborg. The Gustav-Adolf-Werk (GAW) of the Evangelical Church in Germany, founded on the bicentennial celebration of the Battle of Lützen, has as its object the aid of feeble sister churches and commemorates the king's legacy. Swedish royalty visited the GAW headquarters in Leipzig on the festivities of Gustavus Adolphus' 400th birthday, in 1994. Gustavus Adolphus College, a Lutheran college in St. Peter, Minnesota, is also named for the Swedish King. The German Socialist Franz Mehring wrote a biography of Gustavus Adolphus with a Marxist perspective on the actions of the Swedish king during the Thirty Years' War. In it, he makes a case that the war was fought over economics and trade rather than religion. The Swedes discovered huge deposits of copper, which were used to build brass cannon. The cottage-industrial growth stimulated an armaments industry. In his book "Ofredsår" ("Years of Warfare"), the Swedish historian and author Peter Englund argues that there was probably no single all-important reason for the king's decision to go to war. Instead, it was likely a combination of religious, security, as well as economic considerations. This view is supported by German historian Johannes Burkhardt, who writes that Gustavus entered the 30 Years War exactly 100 years after the publication of the Confessio Augustana, the core confession of faith of the Lutheran Church, and let himself be praised as its saviour. Yet Gustavus' own "manifesto of war" does not mention any religious motivations at all but speaks of political and economical reasons. Sweden would have to maintain its integrity in the face of several provocations and aggressions by the Habsburg Empire. The manifesto was written by scholar Johann Adler Salvius in a style common of the time that promotes a "just war". Burkhardt argues that traditional Swedish historiography constructed a defensive interest in security out of that by taking the manifesto's text for granted. But to defend Stockholm, the occupation of the German Baltic territories would have been an extreme advance and the imperial Baltic Sea fleet mentioned as a threat in the manifesto had never reached more than a quarter of the size of the Swedish fleet. Moreover, it was never maintained to challenge Sweden but to face the separatist Netherlands. So if ruling the Baltic Sea was a goal of Swedish strategy, the conquests in Germany were not a defensive war but an act of expansion. From Swedish Finland, Gustavus advanced along the Baltic Sea coast and eventually to Augsburg and Munich and he even urged the Swiss Confederacy to join him. This was no longer about Baltic interests but the imperial capital of Vienna and the alpine passes that were now in close reach of the Swedish army. Burkhardt points out that the Gothic legacy of the Swedes, coalesced as a political program. The Swedish king was also "Rex Gotorum" (Latin: King of the Goths), and the list of kings was traced back to the Gothic rulers to construct continuity. Prior to his embarkment to northern Germany, Gustavus urged the Swedish nobility to follow the example of conquests set by their Gothic ancestors. Had he lived longer, it would have been likely that Gustavus had reached out for the imperial crown of the Holy Roman Empire. December 1594. Gustavus is born in the castle of Tre Kronor, Sweden. October 1611. Gustavus gains the Swedish throne and three wars (Kalmar War, Ingrian War and the Polish War) after his father, Charles IX's, death. February 1612. The Battle of Vittsjö against Denmark where Gustavus almost drowns. January 1613. Gustavus negotiates peace after repulsing the Danish invasion in the Kalmar War with the status quo ante bellum. However, Älvsborg Ransom (1613) had to be paid for Älvsborg fortress. February 1617. After the pressures of Gustavus siege of Pskov, he excludes Russia from the Baltic Sea in the Ingrian War, who cedes Ingria to Sweden. November 1620. Gustav Adolph marries Maria Eleanora. January 1626. The battle of Wallhof where Gustavus successfully uses effective cooperation between infantry and cavalry. July 1626. Gustavus Adolphus and his army disembark at Pillau, Prussia, during the Polish–Swedish War (1626–29). September 1626. Gustavus defeats a Polish force of Sigismund III Vasa in the battle of Gniew. December 1626. Daughter and successor Christina is born. May 1627. Gustavus is shot and seriously wounded (close to dying) in the assault on Danzig. August 1627. The King is seriously wounded in the battle of Dirschau (Tczew), after being shot twice. June 1629. His troops meet up with forces of Polish crown field Hetman Stanisław Koniecpolski and imperial troops under Hans Georg von Arnim-Boitzenburg in the battle of Trzciana, and there Gustavus is almost killed or captured twice. September 1629. Truce of Altmark — Livonia and Estonia is ceded to Sweden as a result of Gustavus Polish wars. May 1630 and 6 July Gustav Adolph lands in Germany to enter the Thirty Years War. April 1631. Gustavus besieges and captures the town of Frankfurt an der Oder in the war. July 1631. Werben, First major field-battle between Swedish and Catholic forces where Gustavus is victorious. September 1631. At the Battle of Breitenfeld, Gustavus Adolphus decisively defeats the Catholic forces led by Tilly, even after the allied Protestant Saxon army had been routed and fled with the baggage train. April 1632. At the Battle of Lech, Gustavus Adolphus defeats Tilly once more, and in the battle Tilly sustains a fatal wound. May 1632. Munich yields to the Swedish army. September 1632. Gustavus Adolphus attacks the stronghold of Alte Veste, which is under the command of Wallenstein, but is repulsed, marking the first defeat in the Thirty Years' War of the previously invincible Swedes. November 1632. At the Battle of Lützen, Gustavus Adolphus is killed in action, but the Swedes win the fight thanks to Bernhard of Saxe-Weimar, who assumes command and defeats Wallenstein. The Swedish war effort was kept up by generals Gustav Horn, Johan Banér, Lennart Torstenson, Carl Gustaf Wrangel and chancellor Axel Oxenstierna until the Peace of Westphalia. A history of Gustavus Adolphus' wars was written by Johann Philipp Abelin. Gustavus Adolphus Day is celebrated in Sweden, Estonia and Finland each year on 6 November, the day the king died at Lützen. One of the traditions on this day is the Gustavus Adolphus pastry. In Finland, the day is also called "the Swedish day". The Gustav-Adolf-Werk (GAW), a society under the roof of the Evangelical Church in Germany, has the objective of aiding feeble sister churches. It's responsible for taking care of the Diasporawork of the EKD and has separate branches internationally. The organization in Austria is still called the Gustav-Adolf-Verein. The project of forming such a society was first broached in connection with the bicentennial celebration of the battle of Lützen on 6 November, 1832; a proposal to collect funds for a monument to Gustavus Adolphus was agreed to, and it was suggested by Superintendent Grossmann that the best memorial to the great champion of Protestantism would be the formation of a union for propagating his ideas. It quickly gained popularity in Germany. The lack of political correctness received some criticism; however, the organization used GAW as it's brand in the meanwhile. The Swedish royalties visited the GAW headquarters in Leipzig on the 400th birthday of Gustavus Adolphus, in 1994. Wildeshausen Married Countess Anna Sofia Wied-Runkel and had issue. Stockholm Stillborn, buried in Riddarholmskyrkan. Stockholm Heiress presumptive to the thrones of Sweden and Denmark; buried in Riddarholmskyrkan. Gripsholm Castle Stillborn, buried in Riddarholmskyrkan. Rome Queen of Sweden (1632 – 1654), never married; buried in Basilica of Saint Peter. Bertolt Brecht's play Mother Courage and Her Children mentions Gustavus Adolphus several times in the earlier scenes during which the characters are traveling with the Protestant Army. The Cook lampoons the "Hero King" by pointing out that first he sought to liberate Poland from the Germans, then sought to liberate Germany from the Germans, and made a profit on the deal. His irreverence for the king also includes the fact that, unlike Mother Courage and the Chaplain, the Cook is a Dutchman not a Swede. In the Ring of Fire hypernovel by Eric Flint and others, Gustavus Adolphus is a major character, having chosen not to attend the Battle of Lützen in which, historically, he was killed. He helps a community of West Virginians, cosmically transported back in time to 1631, bring about a revolution of democracy throughout the Germanies. They, in turn, help to grow the Swedish empire through their technological knowledge of modern-day warfare and the capabilities of mankind. They introduce many ideas to 17th century Europe such as radio, submarines, and airplanes. Gustavus Adolphus is portrayed as a tough, yet compassionate, king with tolerant tendencies toward religion and the rights of the people to establish their own civil liberties. Swedish power metal band Sabaton made a song about Gustavus Adolphus, entitled, "Lion from the North." Its parent album, Carolus Rex, is a concept album based on the rise and fall of the Swedish Empire. Gustavus Adolphus is the leader of Sweden in the turn-based strategy game, Civilization V, introduced in the Gods and Kings expansion. This page is based on the Wikipedia article Gustavus Adolphus of Sweden; it is used under the Creative Commons Attribution-ShareAlike 3.0 Unported License (CC-BY-SA). You may redistribute it, verbatim or modified, providing that you comply with the terms of the CC-BY-SA.